A new populist, Eurosceptic party has achieved the remarkable feat of going from zero seats to becoming the largest single party in the Dutch Senate in a single election, as a young politician likened to a “Dutch Donald Trump” beat seasoned professionals in Wednesday’s poll. 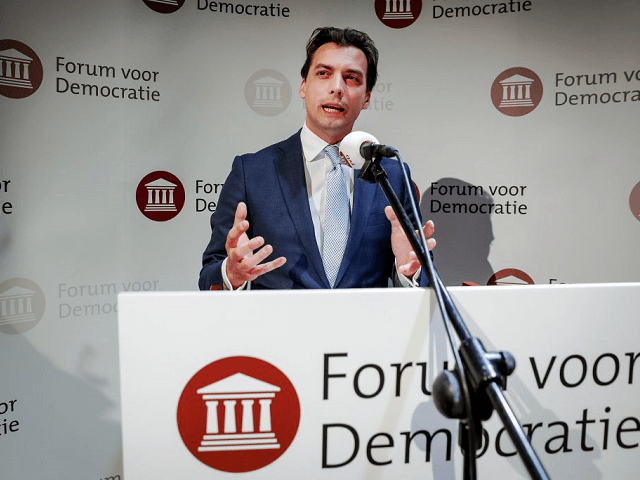 Thierry Baudet’s Forum for Democracy party, which has gained attention for its Euroscepticism, campaigned against open borders politics and against what he calls “climate-change hysteria,” winning 86 seats across the Dutch regions. The victory put his party ahead of even the ruling mainstream conservative People’s Party for Freedom and Democracy (VVD), which achieved 80 seats. Forum was founded in 2016, and this is the first regional election the party has contested. Remarkably, in some Dutch regions Forum was so unexpectedly successful it won the right to appoint more elected members than they actually have registered candidates living in those areas. The regional seats translate through the Dutch constitutional system into seats in the appointed upper house Senate. The party will have 13 seats, making them the largest group — and robbing the governing VVD of their majority. Speaking to Dutch media, leader Thierry Baudet said he was willing to support the establishment parties in government but would demand a “change of course” in certain policy areas, specifically mass migration and government spending on climate change policies. Showing the party’s newfound power, Baudet even demanded the resignation of several key cabinet ministers, including those responsible for home affairs and immigration, in return for support. Unlike other countries where establishment parties have totally ruled out working with populist insurgents, even when they hold seats key to establishing a working government, the Netherlands’ centrist-right Prime Minister Mark Rutte said Thursday he would be willing to consider working with Forum to keep the government in power. Wednesday’s election came just two days after what is now understood to have been a terror attack in the Dutch city of Utrecht, which some media commentators both inside the Netherlands and without have said may have influenced the way people chose to vote. Baudet himself was criticised after the attack for continuing his election campaigning, while others called off rallies. Speaking on the campaign trail, Baudet attacked the governing parties for their role in contributing to the circumstances surrounding the attack, including “naive and lax” policies on open borders and criminal justice. Dutch newspaper Algemeen Dagblad reports several news sources have likened the “television genius” Baudet to U.S. President Donald Trump, who connected directly with voters through social media, bypassing the legacy mainstream media. The unexpected degree of success for Forum reflects and reinforces a broader trend across Europe which sees populist parties giving an authentic voice to concerns held by voters at the expense of traditional, established parties. This trend is broadly anticipated to continue in the European Union’s parliament elections, with as many as one in four voters across the continent expected to vote populist. Breitbart London reported that among those parties hoping to pick up votes in the European Parliament elections is the Sweden Democrats, which is set to double their representation and the Italian League — led by populist interior minister Matteo Salvini — which may become the second largest party in Europe.